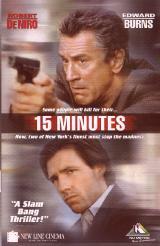 An exhilarating, action-thriller, FIFTEEN MINUTES is a searing indictment of tabloid journalism and the ''take no prisoners'' mentality that pervades contemporay mass media. Filled with dark humour and social commentary about fame in our times, the film follows Jordy Warsaw, an arson investigator who teams with a famous homicide detective, Eddie Flemming, to track two murdering arsonists who are in search of their FIFTEEN MINUTES of fame. FIFTEEN MINUTES promises to lead us through the tense ''reality'' of society's thirst for action and suspense through the cult of celebrity.